Social pensions are designed to provide the elderly population, especially those with low lifetime incomes, basic protection against poverty in old age. In 2009 China introduced a government subsidized social pension system called the New Rural Pension Scheme (NRPS), which now covers 400 million rural residents and has become the world’s largest social pension program. The NRPS was introduced in part due to erosion of the traditional system of intergenerational cohabitation in which children would provide care for the elderly. The erosion has been mainly caused by migration of younger generations to cities, lower number of children, a growing elderly population, and increased life expectancy. This is causing some to demand more market-based services to compensate for their loss of family care. Many rural elderly are thus increasingly likely to suffer from too little support were it not for the introduction of the rural pension system. The NRPS, on average, amounts to one-fifth of pensioners’ earned income but still contains large regional variations. Through a longitudinal study of households of elderly parents and children in impoverished China, IZA Discussion Paper No. 9482 compares families with adult sons and those with adult daughters, as the former lend stronger support to their parents and therefore their co-residence decisions are more sensitive to their parents’ pension receipt. The NRPS pension benefits do not require people above 60 to contribute, and their receipt is not dependent on retirement decisions. Because there is, therefore, a large jump in actual pension receipt exactly when the elderly pass the age 60 eligibility cut-off, the study is able to overcome two main challenges that plague the literature: firstly, usually pension-eligible individuals can be quite different from those who are ineligible; and secondly, differences in characteristics between age cohorts may confound the pension’s impact. The results of the analysis reveal that elderly parents consume more healthcare and other services, even though health insurance coverage shows no significant changes after the pension eligibility cutoff. However, the study also finds a sizable reduction in sons’ (but not daughters’) co-residence with elderly parents after parents begin receiving pensions. Since half of these elderly persons are below the USD 1.25 poverty line, they are very likely to be credit constrained. The larger effect for poorer groups indicates that pension benefits may help to relieve this constraint and make services more affordable to substitute for instrumental support directly provided by their children. These empirical findings hold important implications. They show that even modest pension benefits in China, as compared to other developing nations, could benefit other generations of the extended families. Researchers caution that, meanwhile, substantive changes in living arrangements may offset pension benefits through reduced instrumental support to parents directly provided by children. IZA Discussion Paper No. 10016 goes further to examine the implication of reduced intergenerational co-residence on career choices of the younger generation, including off-farm activities and migration. The results show that sons (but not daughters) are much more inclined to migrate out of their home county around the pension eligibility age cut-off. Adult children are also more likely to migrate out if their parents are healthy. These findings suggest pensions may affect informal old-age support not merely through living under different roofs, but also because the distance between elderly parents and children will become much larger. The erosion of this very important old-age support system will likely generate changes in health among seniors, even in the short term. Fortunately, overall, the NRPS improves the well-being of the elderly beyond their increased utilization of healthcare. Employing China’s most recent national sample, IZA Discussion Paper No. 10037 finds a reduction in the susceptibility of becoming depressed after receiving pension income. The improvement in mental health is found to be larger for vulnerable populations with financial and health constraints. The study argues that pension payments may affect mental health through at least three plausible channels: (i) changes in lifestyle factors, such as independent living, service consumption, leisure time, and social network connectedness; (ii) health investments, such as nutritional intake and medical treatment; (iii) reduced financial stress, increased self-esteem and life satisfaction, and improved confidence in the future. Even though a recent study has found that pension income weakens the non-pecuniary and pecuniary transfers from children to elderly parents, the size of the effect is very small compared to the positive income change for pensioners. 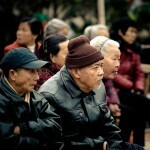 The NRPS had achieved universal coverage at the county level in 2012, thus providing a nationwide, subsidized old-age support system to the older population in rural China. Between 2012 and 2014, China rapidly implemented a similar social pension program for all eligible urban residents. Starting from 2014, China has set an ambitious plan to integrate the rural and urban social pensions into one system across the country, establishing a national pension system that provides wide coverage, basic security, multi-level options and sustainability. Once completed in 2020, this unified pension system will likely serve more than 800 million residents in China. Besides tremendous social and economic impacts for China, the study of social pensions there may have general implications for the U.S. and beyond. As policymakers attempt to address the financial sustainability of the U.S. Social Security program, it is important to evaluate the extent to which Social Security benefits may directly improve old-age health. And if improved, Social Security benefits may be offset by reduced health care expenditures out of the Medicaid or Medicare program. Similar questions have also been raised in Europe where demographic changes are creating important policy questions. Due to the fact that a large proportion of seniors in many developing countries live in poverty with no formal safety net, and that both the family and the community often provide strong informal old-age support, these studies may also provide some valuable insights and understanding into the effects of reforming pension programs around the world. This research was supported by NIH/NIA grant (1 R03 AG048920), Natural Science Fund of China (NSFC) (Approval Nos. 70525003 and 70828002) and the James Tobin Summer Research Fund at Department of Economics at Yale University. What hides behind the German labor market miracle?